With technology playing a big role in our day to day life, having a workstation that conceals plugs and wires is a must! 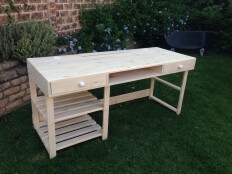 Peter and Annalien show you how to build a desk that have compartments to house electric adapters and cords. Perfect for the home office! Attach sides, front and back to base. Sand everything and white wash.